Whether you are buying your first home, upgrading for more space, or downsizing for more comfort, you will most likely be purchasing some new furniture. Picking out new furniture can be exciting and fun, but also sometimes overwhelming. While you are searching for pieces that reflect your personal tastes, you also need to consider the style of your home and ways in which your new pieces mix with items you kept from your last residence. Below are some basic tips to consider when purchasing new furniture. Depending on your way of life and who else lives in the house, certain colors and fabrics may work better than others. If you have kids or a lot of pets, dark colors in stain-resistant fabrics will hold up better than delicate materials. If you plan to buy a new, expensive sofa that you want to use for many years, avoid going with the trendy colors and stick to something neutral. It will be much easier, and less expensive, to change out accent pieces as styles change, rather than having to spend a lot of money on another big-ticket item. Becoming familiar with different wood types, fabrics, and stone will help you match articles to your home and existing pieces. Also, having an idea of price points for certain quality will give you an idea if you are getting a good deal and how long the furniture will last, especially in the case of wood or stone. Antiques are always a popular choice and add character to a room, but you have to be careful. Make sure drawers work properly on chests and cabinets, and check to see if the handles and knobs fit tightly. Inspect the legs of the piece to make sure they will hold up and don’t need repair. In addition, examine items for rips, stains, tears, watermarks, and scratches as well. While it is tempting to go out and buy everything right away, you may be able to purchase more if you wait for the right time. Furniture stores have many massive sales throughout the year, usually on holidays, as they work to get rid of their inventory. Just minutes from the Reserve on the Saluda are some of South Carolina’s most sought-after shopping. From high-end boutiques to hidden bargains, Columbia offers something for every buyer. Below are some destinations not to miss for those looking to spend a little change for the day. This area is perfect for those looking to spend some time in an eclectic and historic part of the city. Here you will find a unique shopping village, complete with boutiques lined with a variety of clothing, art, goods, gifts, accessories, and more. The neighborhood also offers several dining options including sandwich shops and casual bistros by day and lounges with a thriving music scene by night. If you’re looking for name brands all in one place, Columbiana Centre is where you need to go. With names like Coach, GAP, Williams-Sonoma, and Ann Taylor LOFT, buyers can knock out their shopping lists in no time. In addition to the over 100 stores this mall offers, the centre also provides ample parking, an antique carousel, and a 400+ seat food court. An open-air mall, this shopping spot is anchored by the Sandhill Cinema 16 and is comprised of three large retail centers including the Forum, the Marketplace, and the Town Center. Each offers their own unique merchants and restaurants. As a live, work, play inspired development, the design of the Village at Sandhill is to have everything in one convenient location. In the heart of Columbia off of Forest Drive at Beltline Blvd, Richland Mall has been serving shoppers since 1961. After many changes and renovations, the mall is now home to several known retailers as well as the Columbia Children’s Theatre. Big names such as Belk, Barnes & Noble, Regal Cinemas, and GNC can be found here, bringing in buyers from all over the city. People move for many reasons. Maybe they started a new job or want to explore a fresh city. There are several good reasons to start an adventure by moving to a different neighborhood. If you’re thinking about planning to relocate, you’re not alone. Thousands of people are all over the country. The trick is finding the next perfect place to call home. Buying your first house is the American dream. Moving on from renting to actually owning a home is a big step into adulthood. Just because you are looking for your first house doesn’t mean you shouldn’t get what you want. First-time homebuyers shouldn’t rule out working with a builder to get exactly what they hope for in a new residence. Maybe you love your home, but your neighborhood isn’t offering you anything extra. Many people have come to realize that living in a community that offers experiences for outdoor fun and relaxation is worth making a move for. The Reserve on the Saluda is a neighborhood full of crisp nature and sprawling green spaces, and is the perfect example of a friendly community, offering access to Ridgeline Park, ideal for canoeing, paddle boarding, and kayaking. Many people relocate because their relationship status changes. Marriage (or divorce) changes how much space you need, and finding a different home that will suit you better is a smart decision. Whether it is a promotion, a job transfer, or a career change, what you do for a living significantly impacts where you live. If you have worked hard and got the job of your dreams, then why not look for the home of your dreams. If your commute is overwhelming, then it may be time to move closer to your office. Maybe your first home is not big enough anymore because of a growing family and it is time to upgrade, or after years of hard work you are ready to find a more spacious place. Upgrading can be anything from extra bedrooms to adding a basement. The Reserve on the Saluda offers many designs that cater to your lifestyle with comfortable spaces and unique details. People choose to downsize for several reasons, many times when the kids move out and they don’t need the extra space. Not only does downsizing usually mean a smaller mortgage payment, but it also decreases utility and maintenance costs. Maybe there is not a significant life change that has happened yet, but you just want something different. Starting over in a new home isn’t just about finding a different place to live. It also allows you to make more friends, explore fresh surroundings, and discover additional hobbies. As people retire, their needs and wants change in what type of house they prefer. Sometimes they want to be closer to family or away from the hustle of the city. They prefer to have more relaxed surroundings, or that would like leisure activities to be easily accessible. 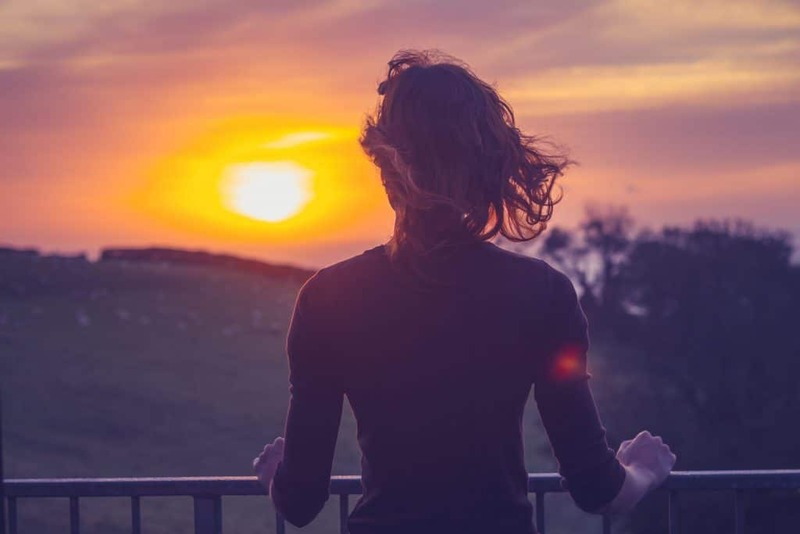 Any of these reasons are an excellent motivation to start over in a new place. Everyone is in search of a better life, whether it is finding some peace and quiet in your neighborhood park, or no longer needing to wait in line for the bathroom. The perfect house is waiting for you. 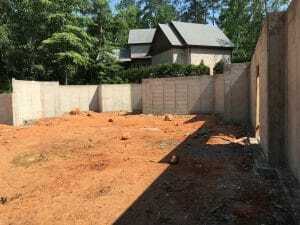 Reserve Your Lot in The Reserve on the Saluda – Only Seven Left! High above the Saluda River on pristine, forested land, located on a plateau that is elevated well above the river, you will find The Reserve on the Saluda. This gorgeous, private community is a true find so close to downtown Columbia. The exclusive riverfront community is part of a ten-mile segment of land along the Saluda River – designated as a State Scenic River by the South Carolina State Legislature in 1991. Hardwood forests, winding ridgelines and the rushing river create a magnificent natural backdrop for beautiful new homes that are or will be built here. Today there are only seven out of the original 19 lots left in the peaceful neighborhood. Living in The Reserve on the Saluda is riverfront living at its best: residents can enjoy many outdoor activities in the area, such as canoeing, kayaking and fishing, as well as jogging, walking and biking along the river. Right outside your home, there is an easy walking trail through Ridgeline Park, the common area in The Reserve on the Saluda, down to the waterfront for easy access to the Saluda River, to put in a canoe or to take a leisurely stroll after dinner. Across from The Reserve on the Saluda is the Three Rivers Greenway. This 9.5 mile linear park follows the Saluda from Columbia to West Columbia and Cayce, and includes a series of pathways, lighted trails and boardwalks, outdoor entertainment spaces, and stunning views of the Columbia skyline. The Reserve on the Saluda, near Sunset Boulevard and the Riverbanks Zoo and Botanical Gardens, is close to many of Columbia’s restaurants and entertainment and options, including Columbia’s Riverwalk Park and Amphitheatre – with access to its varied concerts and events throughout the year. Its proximity to downtown Columbia, the University of South Carolina and a number of top medical facilities and hospitals draws professionals looking to find a home in a neighborhood that is both secluded and central. With three interstate systems in the area (I-26, I-20 and I-77), residents can get easily to most of South Carolina’s other major employment centers. The Reserve on the Saluda is one of Columbia’s best kept secrets – come find out for yourself what (almost downtown) riverfront living is all about and visit our exclusive neighborhood soon to check on the few remaining sites. The Reserve on the Saluda now offers private tours year-round via golf cart, by appointment. 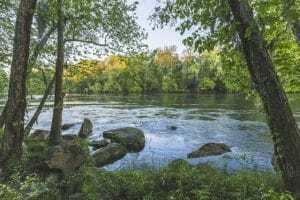 If you want to learn more about living high above the majestic Saluda River, please visit The Reserve on the Saluda or call Saluda Development, LLC at 803.256.1050. Listed by Ted Johnson (803-240-6274) and Brantley Jones (803-223-8695). Our immediate environment, our home, our neighborhood, our surroundings, have a direct impact on our health and stress level. While you take the time to build and maintain your home to your standard of living, what is outside your house affects you just as much as what is inside. Being in a community that values outdoor living is not only beautiful, but it also helps you connect with your neighbors, inspires you to take advantage of your surroundings and spend more time in the open air with your family, and does wonders for your physical and mental health. Imagine coming home to a place that you don’t like. Living in an unpleasant environment that you are not happy with can cause anxiety, depression, or at the least some major frustration. What you hear, see, or feel can change not only your mood, but your nervous and immune system at any moment. This can have a direct impact on your heart rate, blood pressure, and muscle tension. It is widely known that long-term stress is proven to have many unpleasant health consequences. Now, think about coming home to a peaceful setting full of crisp scenery and a sprawling natural landscape. Visualize driving towards your house just seconds away from open greenspaces and flowing waterways. The Reserve on the Saluda is a perfect example of such a neighborhood. While being secluded and environmentally-designed, this friendly community surrounds neighbors with pure beauty, allowing for ample time to enjoy the ambiance of the outdoors. In the book, Healing Gardens, as well as many other known studies, it is stated that when people are hoping to relax, they choose settings like the beach or mountains. Even looking at scenes or hearing the sounds of nature reduces stress and anxiety, and increases a feeling of calm. Public health researchers Stamatakis and Mitchell even state that being around nature reduces mortality. Beyond just the sights and sounds of nature, being within proximity to it on an everyday basis also allows more time outdoors. More time outside means less time in front of the television and more physical activity. 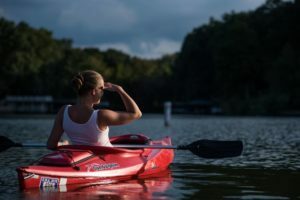 The Reserve on the Saluda encourages this activity with direct access to Ridgeline Park, offering canoeing, paddle boarding, and kayaking, along with a peaceful walking path that takes you to the Saluda River. Lastly, time spent outdoors helps us make connections with other people. A study by Kuo and Coley at the Human-Environment Research Lab showed that time in nature connects us to each other and the larger world, and that those with more greenspace around their homes knew more neighbors, had a stronger feeling of community, and felt more connected. While choosing a place to live often consists of designing floorplans and picking out the perfect cabinetry for the kitchen, consideration should also be taken about location. You want a home that will fit the needs of your family, and provide lasting benefits for years to come. Picking a home that is surrounded by rich landscapes, the smell of greenery, and the sounds of local birds will provide more than mere scenery. It will shape your way of life. Building a new home comes with a lot of decisions. From budgets to bedrooms, you want to make sure you are making the right choices for a long-term, and enjoyable place for you and your family. Many buyers are also looking to build a home that is also environmentally friendly, and while there are some bold options, there are smaller opportunities along the way that make a big difference. Quality windows and doors not only improve a home’s curb appeal, but they can also reduce energy usage, decrease air infiltration that brings in dust and allergens, and lessen interior noise. It is estimated that depending on your energy usage homeowners can save up to 20% of their cooling and heating costs with low maintenance exterior windows. This is why many of the homes featured at The Reserve on the Saluda have Pella® products. Pella windows and doors offer energy-efficient choices that meet or exceed ENERGY STAR certification in all of the 50 states. With South Carolina weather, having a working and efficient HVAC system is essential. Standard air conditioners last usually between 10 and 15 years if they are well maintained on a yearly basis. Heaters typically can last 15-20 years with routine maintenance. With energy conservation considerations guiding the decisions of many purchasers, customers can qualify for a $500 federal tax credit by installing Energy Star equipment. The homes in The Reserve on the Saluda feature an energy-efficient HVAC system for each floor. When building your new home, you should consider where your building materials are coming from. You may want to materials made from recycled products or repurpose materials from the area. Many of the homes at The Reserve on the Saluda use materials that are locally sourced. Some ways this can be done is using the pine trees for hardwood flooring and trim. Another method of staying environmentally conscious is to work with local suppliers in West Columbia. Getting your supplies from these community businesses not only helps the local economy, but it also cuts down on fuel, transportation, and packaging waste. There are several ways that fixtures for the kitchen and bath have evolved lately to help the environment, but most importantly is to use a quality product that doesn’t leak. The EPA estimates that leaks in the average household waste about 10,000 gallons per year, causing a significant spike in your water bill. By installing quality faucets and toilets, you won’t need to worry about leaks and can cut back even further on your water usage. In between floorplans and picking out furniture, make sure to consider these eco-friendly options to help protect the environment. It will save you time, hassle, and will let you enjoy your new home for years to come. If you happen to come across two wooden owls peeking out at you, or the face of a timber bobcat peering through a tree on the Cayce Riverwalk trail, then you have Wade Geddings to thank. This local artist uses a chainsaw to carve animal sculptures into the fallen cottonwood trees along the route. Walking the path, you can see an array of charming animals, including raccoons, turtles, salamanders, foxes, and of course, bobcats and owls. Geddings’ talent was discovered when his high school art teacher, Miss Knight, encouraged the creative daydreamer to explore his gifts. Years later, when he was spending time in Colorado, Geddings was drawn to a shop that did chainsaw sculptures. He finally spoke to the owner who told Geddings he would give him a chance to try it out. He discovered that while most artists use canvas or clay, his preferred pallet is more organic. He eventually returned to South Carolina, and a year or so ago reached out to the city of Cayce about continuing his work. They were impressed, and Geddings was commissioned by Cayce’s Beautification Foundation to sculpt twelve pieces. Geddings is able to use his imagination when examining the old fallen trees on the trail, thinking about what could be possible with some skill and creativity. With anything from Beastie Boys to Bee Gees playing on his earbuds, he deactivates the chain brake, sets the master control, and fires the engine with the starter rope. Wood chips fly all around, the shrill of the chainsaw echoes in the air, and a shape starts to take form. But, before he gets in front of a fallen tree, he studies the figure of the animal he plans to carve, particularly their heads, and practices on spare pieces of wood. Many of the fallen trees Geddings carves with his Stihl chainsaw fell during the historic floods that heavily damaged the area in 2015. By replacing this destruction and dead wood with art, he believes some of the pain and sadness from that experience will be healed. This self-taught artist has gained the attention of residents and visitors alike. People witnessing the process can’t help but to stop and see what will transform from what started as a fallen tree. And, those discovering the carvings on the trail can’t help but appreciate the nod to nature and the virtuosity of turning nothing into something beautiful. Secluded luxury. A welcoming community. Beautiful homes. Riverfront living. It is time to come and see what Columbia has been raving about. On Sunday, June 4th, The Reserve on the Saluda is hosting an Open House for interested home buyers. The Reserve on the Saluda is a one of a kind neighborhood featuring the best of nature while being mere minutes from downtown Columbia. Homes are private, meticulously designed, and environmentally minded. The neighborhood offers the unique opportunity to be a part of a community that loves the outdoors and takes advantage of the direct access to Ridgeline Park and the Saluda River. The Reserve on the Saluda offers the best of both worlds, blending nature and city life, and provides the opportunity for active lifestyles in a laid-back setting. With only seven home sites remaining, don’t miss this opportunity to see what this unique community offers. The Open House will take place at 1031 Laurel Crest Drive, West Columbia, SC 29169, and will be between the hours of 1:00 – 4:00 p.m. Visit www.thereserveonthesaluda.com or call 803-240-6274 for more information. A neighborhood full of crisp nature and sprawling green spaces, yet minutes from a metropolitan hot spot. A community set among flowing waterways, yet easily connected to freeways. A place where you can leave the stress of your workday behind you, but swiftly make your way to the office on Monday morning. A home that caters to your lifestyle with comfortable spaces and unique details yet doesn’t break the bank. If you think that having the best of seclusion, convenience, and value is impossible, then you haven’t seen The Reserve on the Saluda. Where you live, it matters. It is where you spend most of your time, meet new friends, and make a significant investment. You may be looking to raise a family, or find a place to enjoy your retirement. When selecting a home, choosing something in a nature-inspired community has a lot of benefits. Natural settings are relaxing, and give a sense of peace. Open green spaces and geographical landmarks make way for a multitude of opportunities to enjoy outdoor sports, hiking, neighborhood gatherings, and more. However, if a community is too far away from a city center, residents may start to feel too secluded and get annoyed with long commutes. Of course, being in the middle of a bustling city center also has its perks. From easy access to shopping, dining, and entertainment, to minimal every day commutes to business and medical centers. But, living in a city may not be for everyone. While the energy and excitement may be fun for a night or two, some families would like an alternative living environment. The Reserve on the Saluda is a perfect example of a secluded, environmentally-designed, friendly community, offering access to Ridgeline Park, ideal for canoeing, paddle boarding, and kayaking, and a serene walking trail framed by hardwood forests that guide you to the famous Saluda River. 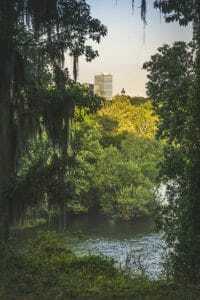 However, just across the river from Columbia, The Reserve on the Saluda is only a short drive to popular locales in the heart of downtown Columbia. The State Capitol Building, the University of South Carolina campus, and businesses centers are a quick five-minute drive, as well as the Kroger Center, the Colonial Center, and the Carolina Coliseum. 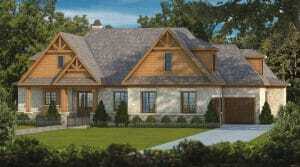 The Reserve on the Saluda combines private, exclusive living with the amenities and conveniences of city life. It is one of the only neighborhoods in the country that has an exceptionally communal atmosphere, yet still, feels reserved because of the beautiful natural landscape. Here you will find country-life without the seclusion, and city-life without the hustle and bustle. Where else can you find the best of both worlds? 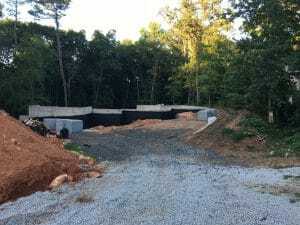 Dan and Kelly Wright purchased their beautiful lot in The Reserve on the Saluda in 2015, and started construction on their 6 bedroom, 4.5 bath home earlier this year. This 5,500 sq. ft. home is designed to take advantage of the splendid natural setting, including the magnificent river view. In addition, the steel I-beams for the home are manufactured by Cayce Steel in Cayce; the milled pine logs will be sawed at Backman Lumber before Lindler Manufacturing will turn them into trim and finished hardwood flooring. Stier Supply in Irmo provides the excellent quality lumber for the home. All appliances will come from S & G Builder Appliances, a well-known family-owned company in Columbia. A nice bonus from working with local manufacturers and ‘home-grown’ companies is the opportunity for the Wrights to build meaningful connections within the community. The home, designed by architect Mike Garrell of Garrell Associates, Inc., includes a stunning kitchen with a walk-in butler’s pantry and convenient desk space, while a large laundry room and mudroom also add to the family’s easy, outdoor lifestyle. “We like the lush, mountain feel of The Reserve on the Saluda, the peaceful and secluded environment and the ability to walk right down to the Saluda River. What really convinced us to build here, though, was the exclusive community’s convenient location just minutes from Dan’s environmental testing laboratory in West Columbia where we both work, and near the heart of downtown Columbia with its arts, restaurants and sporting events. 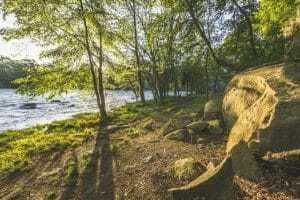 “This is one of the most beautiful, secluded spots left on the Saluda River, and our family is happy to call The Reserve on the Saluda home,” says Kelly. To learn more about living on the banks of the majestic Saluda River, or about the few lots that are still available in this gated community located close to downtown Columbia, please visit The Reserve on the Saluda or call Saluda Development, LLC at 803.256.1050.